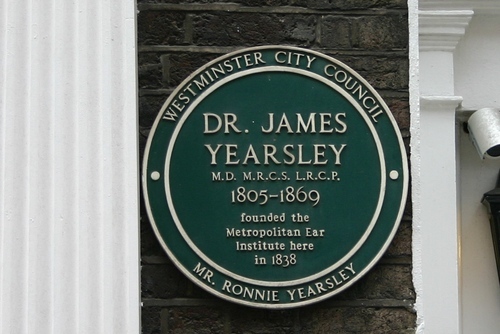 James Yearsley was an outspoken aurist who was known in mid-nineteenth century London for irritating other medical practitioners with his obnoxiousness. 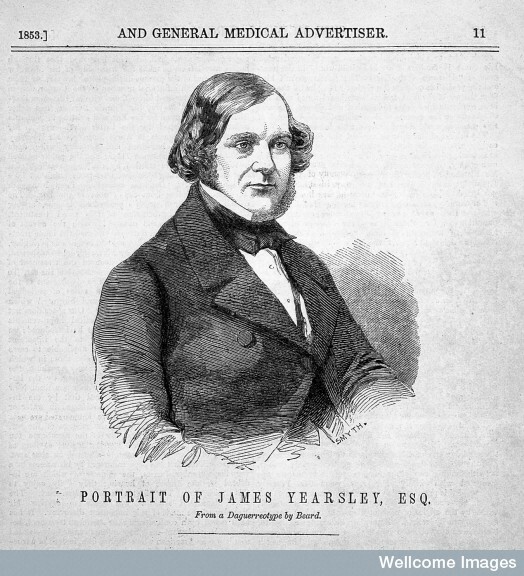 He’s a very interesting fellow to examine the field of aural surgery within the 1830s medical reform and march of progress movements in England–no wonder he’s become the subject of my last dissertation chapter. Born in Chesltenham, Gloucestershire, Yearsley started his career in medicine in 1822 with an apprentice to a Ralph Fletcher, a skilled surgeon in Gloucester. The apprenticeship only lasted two years before Yearsley became a student at St. Bartholomew’s Hospital in London, and qualified in 1827 for practice with a diploma of membership in the Royal College of Surgeons, London, and a licentiate of the Society of Apothecaries. Later in his life he obtained a licentiateship of the Royal College of Physicians, Edinburgh in 1860, and a MD from St. Andrews University in 1862. In the history of aural surgery, Toynbee is known for two main contributions: (1) his development of an artificial tympanum (eardrum), which I’ll discuss in a later post, and (2) his reputation as a skilled aural surgeon and founding of the Institution for Curing Diseases of the Ear in 1838 at 29 Sackville Street in Piccadilly. Like many other 19th century hospitals and dispensaries, the Institution changed hands and names–it later became the Metropolitan Ear Institution and eventually the Metropolitan Ear, Nose, and Throat Hospital. 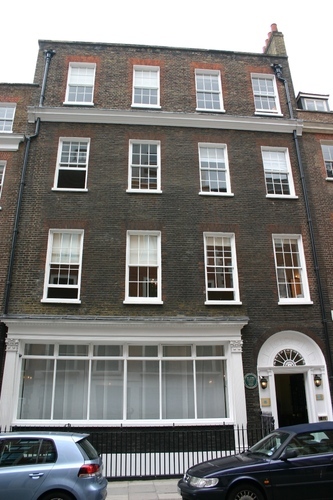 The Metropolitan Ear Institution at 29 Sackville St.
Yearsley also published several treatises on aural diseases, and was a defender of Eustachian tube catheterization as a prominent surgical procedure among aurists. He also published a popular treatise on stammering that he advocated could be cured by removing the tonsils.